Lauded for “superb playing” and “poised, alert musicianship” by The Boston Globe and labeled “definitely a man to watch” by London’s The Independent, American pianist SPENCER MYER is one of the most respected and sought-after artists on today’s concert stages. Adding to his North American credentials, Spencer Myer includes in his current season debuts with the Garden State, Massapequa and Northeastern Pennsylvania philharmonic orchestras, The Omaha Symphony and Canada’s Windsor Symphony Orchestra, as well as return engagements with the Canton, Chattanooga and Richmond (IN) symphony orchestras. His solo recitals and chamber music collaborations take him throughout the United States, and he continues as half of the Daurov/Myer Duo, having teamed up with the award-winning cellist Adrian Daurov in 2012. Spencer Myer’s recital appearances have been presented in New York City’s Weill Recital Hall, 92nd Street Y and Steinway Hall, Philadelphia’s Kimmel Center and London’s Wigmore Hall, while many of his performances have been broadcast on WQXR (New York City), WHYY (Philadelphia), WCLV (Cleveland) and WFMT (Chicago). An in-demand chamber musician, he appeared for five summers at the Lev Aronson Legacy Festival in Dallas with cellists Lynn Harrell, Ralph Kirshbaum, Amit Peled and Brian Thornton, and enjoys a recurring partnership with the Miami String Quartet at the Kent/Blossom Music Festival. Other artistic partners include clarinetist David Shifrin, Cardiff Singer of the World winner Nicole Cabell, the Jupiter, Manhattan and Pacifica string quartets and the Dorian Wind Quintet. Festival appearances have included those of the Bard, Blossom, Cape Cod Chamber, Colorado, Mendocino and Skaneateles music festivals, Canada’s Concerts aux Iles du Bic, Spain’s Gijon International Piano Festival and Valencia International Piano Academy, and Indonesia’s Yogyakarta International Music Festival. An enthusiastic supporter of the education of young musicians, Spencer Myer has been a frequent guest artist at workshops for students and teachers, and has served on the faculties of the Baldwin-Wallace University and Oberlin College conservatories of music. He is a graduate of the Oberlin Conservatory of Music, The Juilliard School and Stony Brook University. In the fall of 2016, he was appointed Artist-Teacher in Piano and Collaborative Piano at the Longy School of Music of Bard College in Cambridge, Massachusetts. Mr. Myer was the subject of the cover interview in the January/February 2019 issue of The Piano Magazine: Clavier Companion, relating his thoughts on practicing, performing, teaching and mentoring the next generation of pianists. Spencer Myer’s debut CD for harmonia mundi usa - solo music of Busoni, Copland, Debussy and Kohs - was released in the fall of 2007 to critical acclaim by Fanfare and Gramophone magazines. He can also be heard on a composer-conducted Naxos CD in performances of three concerti from Huang Ruo’s Chamber Concerto Cycle and in a performance of Ravel’s Chansons madécasses, included on "Intimate Masterpieces," a 2013 CD featuring faculty and alumni of the Oberlin Conservatory and issued by Oberlin Music. Mr. Myer’s most recent three recordings – "William Bolcom: Piano Rags", the Brahms Cello Sonatas with Brian Thornton, and the Debussy Cello Sonata and Brahms Clarinet Trio with Brian Thornton and Afendi Yusuf – are available on the Steinway & Sons label. "SPENCER MYER PLAYS PRELUDES & VARIATIONS"
Myer’s programme was itself a showcase, offering an interesting mix of styles [Haydn, Debussy, Liszt, Albeniz, Moszkowski]. After making the hardest things look easy, Myer played us out with a gentle Bach transcription, whose web of cantabile themes went at different speeds and cast a lovely spell. Myer is definitely a man to watch. This is one gorgeously played and engineered album [Bolcom: Piano Rags], and the music is sophisticated and charming. William Bolcom has done for rags what Chopin did for polonaises, staying true to the rhythms of a popular dance while adding to it the touch of a skilled composer and harmonist. Spencer Myer’s playing is truly outstanding; his dynamics, phrasing and use of rubato are all well considered, and he’s sensitive to every compositional and structural detail. His tone is gloriously warm and burnished, and the acoustics flatter him with their evenness and clarity; the piano is represented perfectly. Get this one! Spencer Myer gave a thoughtful, satisfying recital at the Phillips Collection. This youngish American artist has amassed a varied career of solo engagements, chamber music and lieder accompaniment, a healthy diversity that guards against the it's-all-about-me attitude one sees in many pianists. The program consisted of Debussy, Albeniz and Moszkowski. All well and good, with Myer displaying intelligent musicianship and excellent keyboard command. He gives the impression of playing music, not the piano; overall the concentration and keyboard imagination were exemplary. The Piano Concerto in F is an intricate orchestral pastiche brimming with multiple themes and disparate moods infused with lush Romanticism and the pulsing swagger of urban jazz. As a central percussive and melodic element, guest soloist Spencer Myer’s performance was commanding and vivacious from beginning to end. Especially in his playful dialogue with the ensemble during the Adagio movement, he articulated all of Gershwin’s bluesy savoir faire with captivating finesse. With crisp timing, exquisite touch, and a firm grasp of musical proportion, American pianist Spencer Myer earned the top spot in the 20th annual New Orleans International Piano Competition. His 50-minute recital matched what veteran observers and the six-person jury had seen throughout the competition: an unruffled professional who consistently drew singing, lyrical sounds from his Steinway concert grand. The sense of immediacy was present throughout Chameleon’s concert, nowhere more so than in its centerpiece: an impassioned and broadly scaled performance of the Brahms Piano Quintet. One could hear and admire not just the familiar, surging themes but also the intricate details that often go unnoticed in the tumult. That intimacy also allowed one to appreciate the superb playing of guest pianist Spencer Myer, who anchored the Brahms with poised, alert musicianship and generous tone. Spencer Myer is a pianist on the rise. His playing was a model of refinement, urgency and aristocratic vitality. Over several decades, Bolcom combined his gifts to forge a collection of piano rags that have kept performers and listeners mesmerised. Spencer Myer certainly sounds smitten with these disarming pieces. He plays Bolcom’s miniature brainstorms with equal doses of sass and sweetness, giving full voice to the drama, poetry and humour that overflow from the page. Spencer Myer gave an impressive, elegant rendering of Rachmaninoff's Rhapsody on a Theme of Paganini, earning a standing ovation and a trio of curtain calls. We would like to hear more from this young talent. Spencer Myer, who often plays here [with Haddonfield Symphony Orchestra] played the Ravel concerto with so much personal affection as to seem self-indulgent in another setting. But with Milanov’s ultra-sympathetic accompaniment and the hall’s close-range sound, you had to be thoroughly drawn in - so much that all the Chopin-esque touches more experienced pianists have unsuccessfully tried to bring to the piece seemed convincing from him. Not only is Myer an entirely finished artist, but his playing was so acutely logical yet expressive that the inimitable Mozartean magic of a great performance was patently evident. There was plenty of lyricism in his interpretation [Prokofiev Sonata #7], and not only in the bitter song of the second movement. The finale - a fearsome juggernaut of syncopated, single-minded energy - wasn’t used as an excuse to hammer the listener into admiration. There was a lot of admiration to spare for Myer after the final pounding notes, however, as the audience erupted in cheers. Myer played Concerto No. 5 with panache and exhilarating fleetness. Most importantly, he showed an overall grasp of Beethoven’s characteristic idiom and method. He was always acutely sensitive to the composer’s many subtleties. Above all, he remained supremely poetic. It was nuanced playing to the hilt, warm as well as virtuosic. He fully deserved the ecstatic audience’s standing ovation. More impressive than Bernstein’s music itself was Spencer Myer, guest pianist. Downstage of an already triumphant symphony, Myer’s hands were a show of their own. For almost 40 minutes his fingertips seemed to have an almost electric relationship with the keyboard, while the rest of his face and body remained stoic. The effect of this deep investment in the music was hypnotizing. The conclusion of Bernstein’s Symphony No. 2 was joyous, and the audience stood up to applaud Myer just as much as the orchestra and Wilkins. A new series from Harmonia Mundi USA presents three young American pianists, all fellows of the American Pianists Association and all destined for major careers. Classics of the American piano repertory are the main attraction; recording quality is excellent and the presentation, with informative booklet notes and the tasteful photos, entirely free of marketing hype. Spencer Myer starts splendidly with the premiere recording of a minor masterwork. Ellis Kohs, after studies with Piston and Stravinsky, spent most of his life teaching at the University of Southern California; his Variations on L'homme armé were written just after World War II. In around six minutes, Kohs puts the famous Renaissance tune through a dizzying variety of settings, moving from simple counterpoint to violent dissonance and back again. Myer's clarity of touch, rhythmic buoyancy and clean textures should win many new friends for this and Busoni's variations on Chopin's C minor Prelude. The gifted young American pianist, Spencer Myer, brought his impeccable performance skills to the Tennessee Theatre for the opening performance of the Knoxville Symphony Orchestra’s 73rd season. Those who were in the audience for the Artist Series solo recital with pianist Spencer Myer can consider themselves lucky. Myer is a masterful artist who can thrill even the most jaded listener, which he did so thoroughly in his first Sarasota appearance. What was most striking about this program was the extreme breadth of style tackled by the soloist. Myer managed the delicacy and relative control of the Handel Suite, ventured into modernism with Janacek and back again to early Romanticism with Beethoven and Schubert, doing so with a firm scholarly basis for his expressive fluency. Spencer Myer, familiar to northern Minnesota audiences, but in his first performance with the DSSO, came on stage with Maestro Meyer. They teamed up to present the crown of Beethoven’s five piano concertos, No. 5 in E-flat major. Meyer and Myer were supremely smooth and graceful, offering one of the most lyrical performances of this work I’ve ever heard. The audience erupted with overflowing enthusiasm. The Cliburn name is inextricably connected to the piano, and Sunday’s concert brought us four pianists. Two of them performed collaboratively, But Spencer Myer and Henry Kramer each had a solo turn, and both wowed listeners. Spencer Myer’s performance of Copland’s Piano Variations served as a delightful reminder that Copland had a considerable output of abstract music. Myer’s remarks about the piece were brief and helpful. His playing–his playing was transfixing. In less capable hands, this music could seem like a mere exercise in complexity. Myer, though, produced interesting lines, varied sonorities, and ringing overtones. 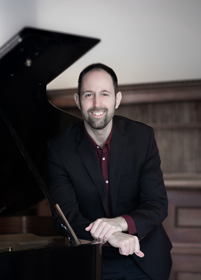 Spencer Myer is a frequent guest, having played both Mozart and Rachmaninoff with them since 2012. Myer brought precision and beautiful tone to bear in the Beethoven Emperor Concerto. His scrupulous articulation combined with the piano’s bell-like upper register to make Beethoven’s sweeping passagework positively sparkle. The Adagio was profoundly beautiful. Beethoven’s galloping finale ignited a standing ovation and sent everyone home singing. Spencer Myer is a fantastic pianist, bringing polished phrasing and rubato to a genre too often played robotically. His tone is warm and burnished, and the acoustics flatter the piano. The night was titled ‘A Private Audience’ and its first half was devoted to a selection of Bernstein’s Anniversaries for solo piano. These are small musical portraits, dedicated to friends and fellow travelers over the course of Bernstein’s virtuosically eventful life. The composer’s elder daughter, Jamie Bernstein, was present as narrator of this work, introd8ucing each tribute with a salutary blend of familial warmth and sharp-eyed insight. The interweaving of her stories, illustrated with project family photos, and the music itself – laid out with uncommon grace by pianist Spencer Myer – brought this first half of the concert a rare sense of intimacy. It felt less like a buttoned-down tribute to a classical icon than an evening in his own living room, gathered around the piano. Cellist Brian Thornton explores late chamber works by Debussy and Brahms with creative polish and refined sensitivity on his latest album from Steinway & Sons. Joined in masterful collaboration by a fellow Cleveland Orchestra member, principal Clarinetist Afendi Yusuf, and the superb pianist Spencer Myer. Thornton pairs Debussy’s 1915 Cello Sonata with Brahms’ 1891 Clarinet Trio, Op. 114, a thoughtful juxtaposition of the composers’ mature styles.